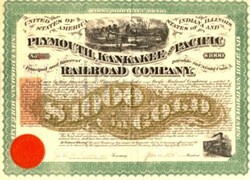 Beautifully engraved certificate from the Plymouth, Kankakee and Pacific Railroad Company issued in 1871. This historic document was printed by Henry Seiber & Bros. and has an ornate border around it with a vignette of steam engine pass through a town and an imprinted orange one dollar revenue stamp. This item is hand signed by the Company's President and Secretary and is over 133 years old. This bond is signed on the back by J. Edgar Thomson as trustee. Bond has been folded and shows some signs of wear. Thomson, John Edgar 1808 to 1874 - Civil engineer, railroad executive, and financier. Third president of Pennsylvania RR during its greatest period of expansion.